Welcome. The smooth sides of V-belts are what grips the pulley. The harder the pull, the more it grips, because of the V angle. The top and bottom do not touch anything. Models or Types Orig. no. 17/32" x 11/32" x 42.5"
21/32" x 13/32" x 34.0"
17/32" x 11/32" x 32.5"
17/32" x 11/32" x 34.5"
3/8" x 21/64" x 29.0"
0.39" x 0.24" x 28.7"
3/8" x 21/64" x 28.5"
15/32" x 5/16" x 38.5"
0.38" x 0.35" x 37.8"
0.38" x 0.35" x 37.0"
1/2" x 5/16" x 41.0"
0.38" x ???? x ???? 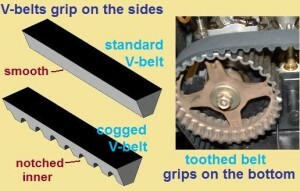 First is a graphic showing the cross-sectional shapes and sizes of replacement V-belts that can be used on mopeds and small scooters. V-belts for variators (variable pulleys) are the “low profile” type, called “variable speed belts”. V-belts for fixed pulleys are the “high profile” type, called either “classic” or “cogged”, see below. V-belts are made by Gates in different styles, widths, and lengths. 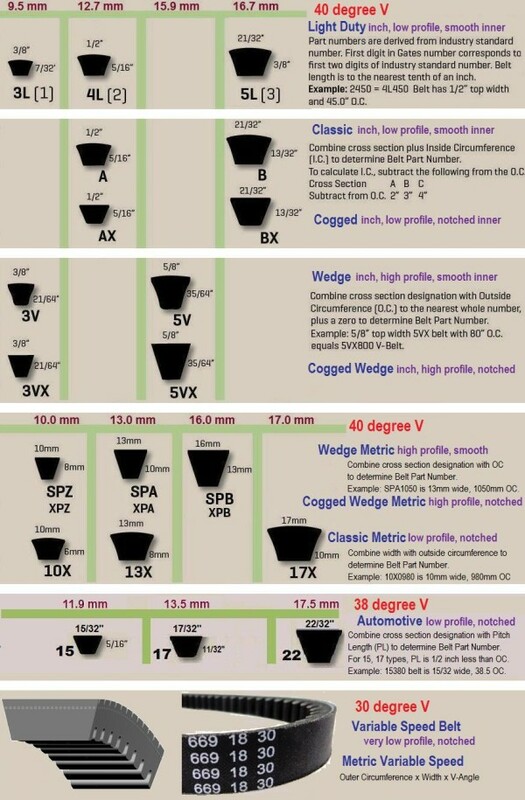 Here the width choices from 9.5 to 17.5 mm. Larger or smaller sizes are omitted. Smooth or Notched: The notches, or cogs, on V-belts are not teeth, like on toothed belts. They are relief slots that help the belt bend easier, for less friction and more efficiency. Equipment that originally had smooth belts can use cogged belts, and visa versa. 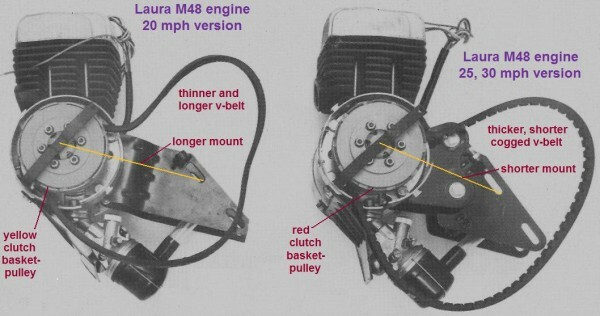 Batavus/Laura M48 20mph v-belt: So far there is only a part number and a photo, but no width, length or belt number available. It’s size can only be estimated from this photo. If anyone knows, please tell Shaun by email. You are currently browsing the archives for the belts category.